The explosion of rumors that Apple is working on a variety of iPhone designs including smaller ones and iPhones with 4 inches screens has spawned a significant amount of speculation and mockups about the possibilities. In particular, the talk of a 4 inch-screen and rumors of an “edge to edge” screen resulted in this mockup which shows that a 4″ screen could fit on an existing iPhone 4 sized device by extending the screen to the left/right edges. 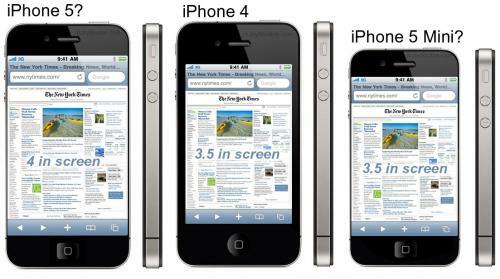 Similarly a smaller iPhone could use the existing 3.5 screen in a similar fashion.